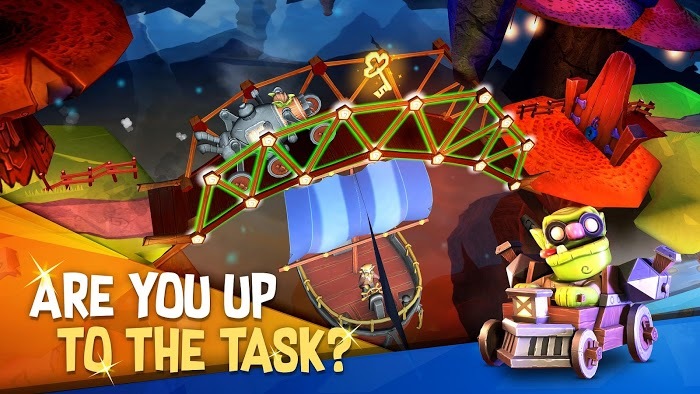 Bridge Builder Adventure is a type of game that is not too new in the gaming market; it was a lot of great players to try. It is this that makes bridge construction simulation products have a certain appeal. We can see it as a puzzle game but with gameplay that requires a lot more logic and complexity. The requirement of a game screen is simple, but its customization is extraordinarily diverse and complex. To play this game, gamers must have a little knowledge of physics as well as the perception of architecture. However, do not be too afraid because in the game there will be support so that players can easily overcome. Graphics of the gene is definitely one of the highlights that makes it more attractive and attractive to players many times. We must first understand that it is a game that uses the laws of Real Physics to operate. So players will also enjoy a game where everything is designed strictly and practically. You will play the role of a goblin who is having a problematic incident when he wants to cross a deep area but cannot do it. 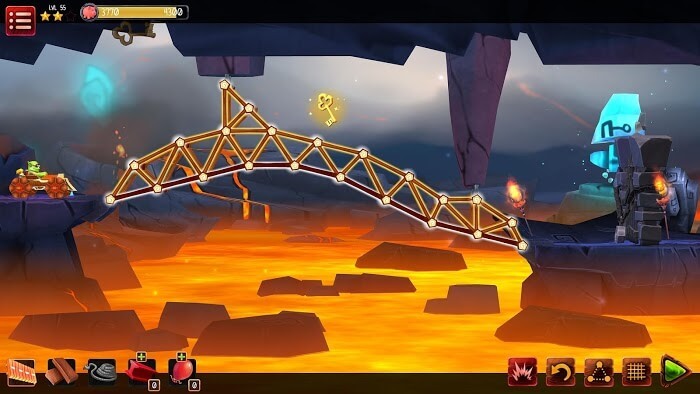 The player must help him build a bridge to work correctly. 3D graphics with colors are designed in a bright way that will make this game friendly for all ages. 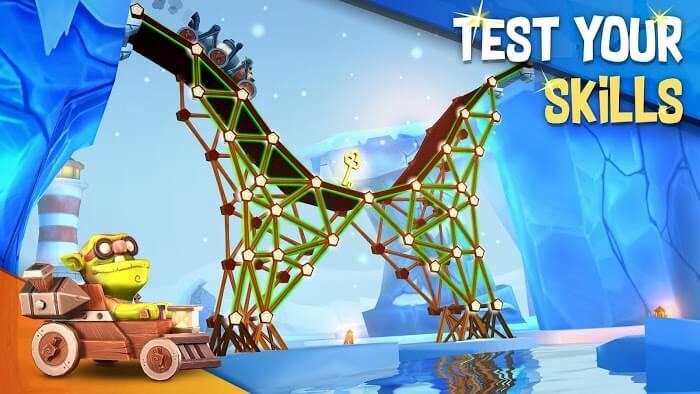 The game is extremely simple when you will have to build a bridge so that it usually works. It means that when our character rides the car across the bridge, it does not collapse and succeeds to the other side. But there will be a gate waiting for you and require a key to pass the gate and win the game. So where to find the key? The key appeared on the screen, floating in midair. The player will have to build the bridge so that when the car passes, the character must get that key. In general, make sure that the two requirements are that the bridge must be reliable and must lead through the key. The game will offer a whole new world designed by the manufacturer. Players will be taken to many places, visiting many new and cute scenes. Sometimes players will build bridges in Spring valleys, sometimes going to glaciers and sometimes at the volcanic heart. This diverse change makes the player not bored despite playing the game many times. Shroomland, Cloudopolis, Vulcania, and Winterland! All have their interesting things, but you have to spend a lot of time to learn and enjoy them thoroughly. Entering a dangerous game, the player will use the materials that you are provided by that game. If you have used up all the ingredients and still have not finished building the bridge, it must be rebuilt from the beginning. In addition to the original materials, players also have special powers and power-ups. They will make your game screen much more comfortable. But players also pay quite high prices to get them. The game offers up to 60 levels for players to pass. 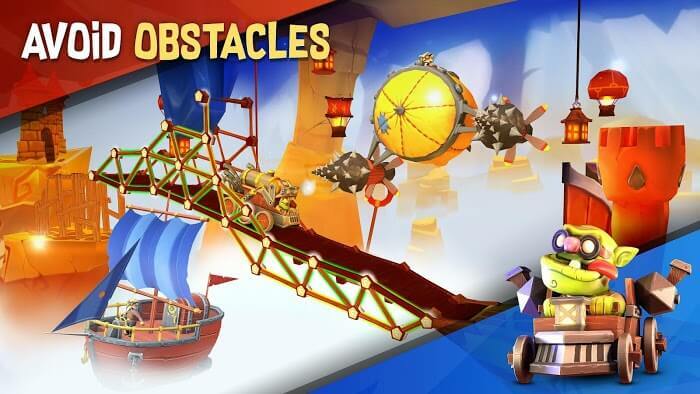 Each level has different difficulties whether you can complete them all?